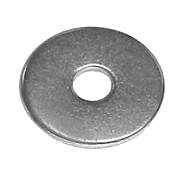 PRODUCT: #10 (3/16 inch) ID x 1-inch OD, Flat Galvanized Steel Washer / Fender Washer. Price/1000. APPLICATIONS: Flat washers are used typically under the head of a bolt or a nut to distribute the foces applied when tightening. For Use With Screws and Bolts. DETAILS: 3/16 x 1" Zinc Plated Fender Washer, ID: 1/4. OD: 1". Thickness 0.062 In., Thickness Tolerance +0.05/-0.08 In., Package Weight 14.5, Package Quantity 1000.